A high-level delegation of the Government of China, representatives from Italy, several African countries and United Nations officials, participated today in a workshop aimed at boosting the sharing of knowledge and building partnerships to achieve the Sustainable Development Goals on eradicating hunger and extreme poverty by 2030. The workshop, attended by over 90 international experts, and including participants from academia and the private sector, was jointly organized by the three Rome-based UN agencies - the Food and Agriculture Organization of the United Nations (FAO), the International Fund for Agricultural Development (IFAD), and the World Food Programme (WFP) – and the International Poverty Reduction Center in China (IPRCC) and the China Internet Information Centre (CIIC). Discussions focused on how to best share knowledge and promote partnerships that establish efficient mechanisms in support of Agenda 2030 and the Sustainable Development Goals, in particular, SDG1, No Poverty and SDG2, Zero Hunger. 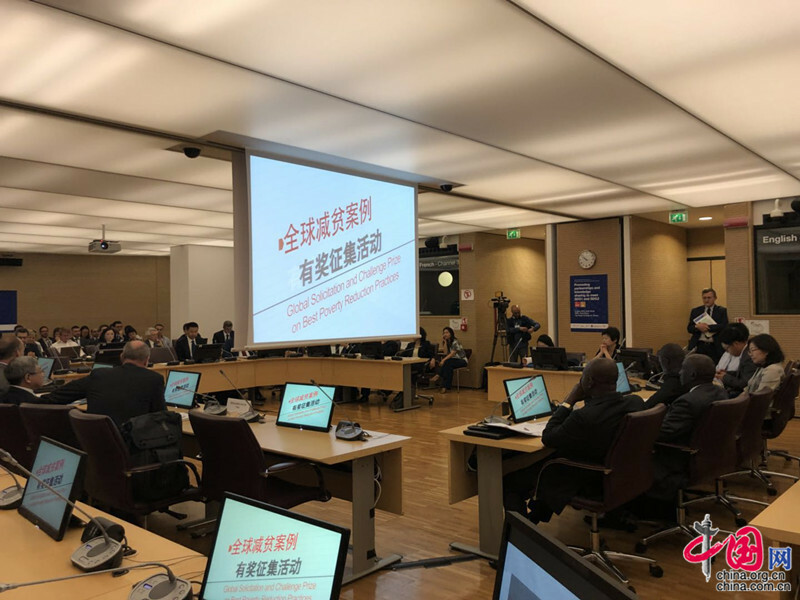 Representatives from China, Ghana, Kenya, Senegal, FAO, IFAD and WFP presented and discussed successful models, good practices and enabling policies for poverty reduction and hunger eradication. The workshop also served to strengthen the basis for the establishment of a regular forum to convene development and government agencies, academia and civil society to discuss and share experiences on poverty reduction and hunger eradication. Mr. Ou Qingping, Vice Minister of The State Council Leading Group Office of Poverty Alleviation and Development introduced China’s “decisive progress in the uphill anti-poverty campaign”. “After five years’ hard work, 68.53 million people have been lifted out of poverty. Poverty incidence rate dropped from 10.2% to 3.1%. This time, China beat itself and accomplished the greatest achievement in the history of China’s poverty reduction,” he said. “This workshop, since its successful convening in 2017, has received a large amount of positive responses from all stakeholders. Now we are successfully convening the workshop again in Rome. This indicates that a new cooperative relationship for poverty reduction is coming into shape,”he added. FAO, IFAD, WFP, IPRCC and CIIC also issued aJoint Communiqué on Strengthening Partnership for the Eradication of Poverty and Hunger through Knowledge Sharing, Exchange and Cooperation. The agencies agreed to develop and strengthen their partnership by enhancing knowledge cooperation between China and the Rome-based agencies on poverty reduction and hunger eradication agendas and by reinforcing South-to-South and Triangular Cooperation in poverty reduction. 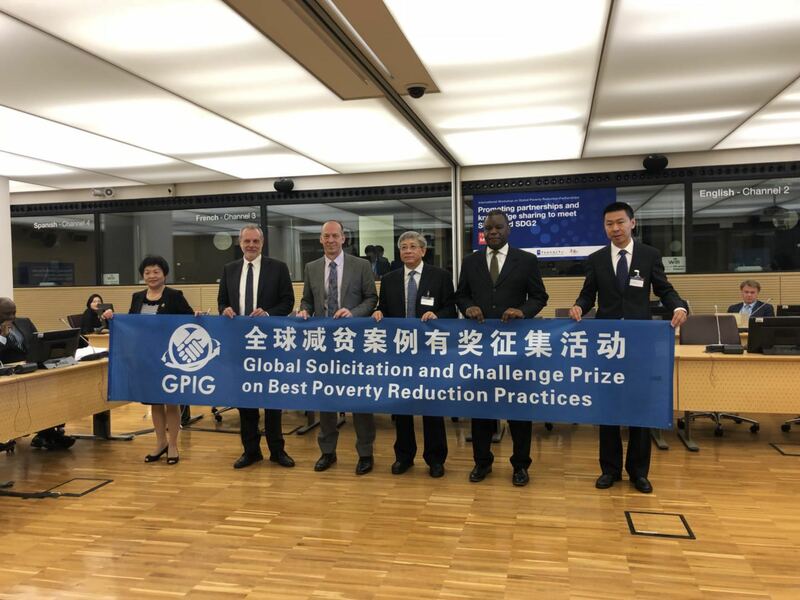 As part of the efforts to enhance knowledge sharing in poverty reduction, theGlobal Solicitation and Challenge Prize on Best Poverty Reduction Practiceswas presented at the workshop. The prize was jointly launched by CIIC, IPRCC, the World Bank, the Asian Development Bank, FAO, IFAD, and WFP at the 2018 China Poverty Reduction International Forum that took place on May 23 in Beijing. As the first global solicitation for poverty reduction case studies, this initiative seeks to obtain 100 case studies that have proven to be successful in fighting poverty. Mr. Zheng Wenhua, special assistant of editor-in-chief of CIIC, introduced that case studies, papers, concept notes and other relevant knowledge products will be showcased in the Global Poverty Reduction Online Knowledge Sharing Database (http://case.iprcc.org.cn/) launched last year.